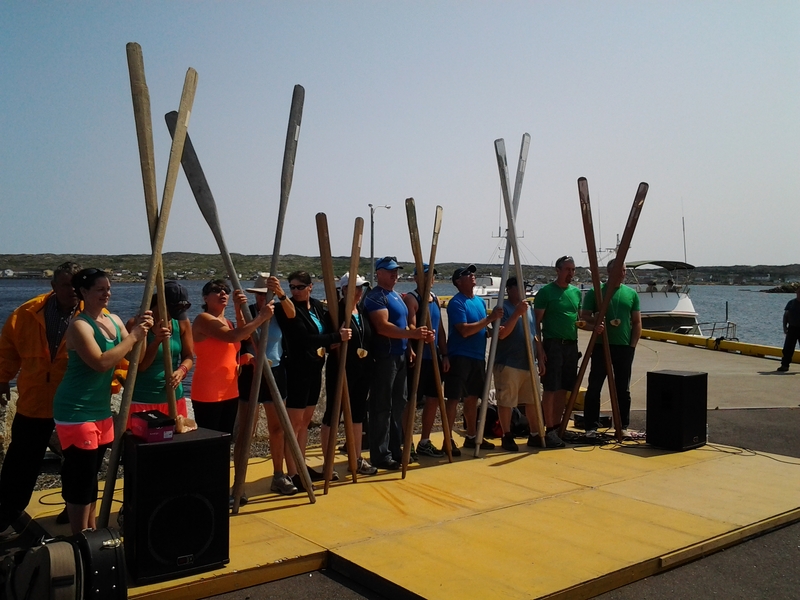 The Great Fogo Island Punt Race is open to rowers from all over the world. 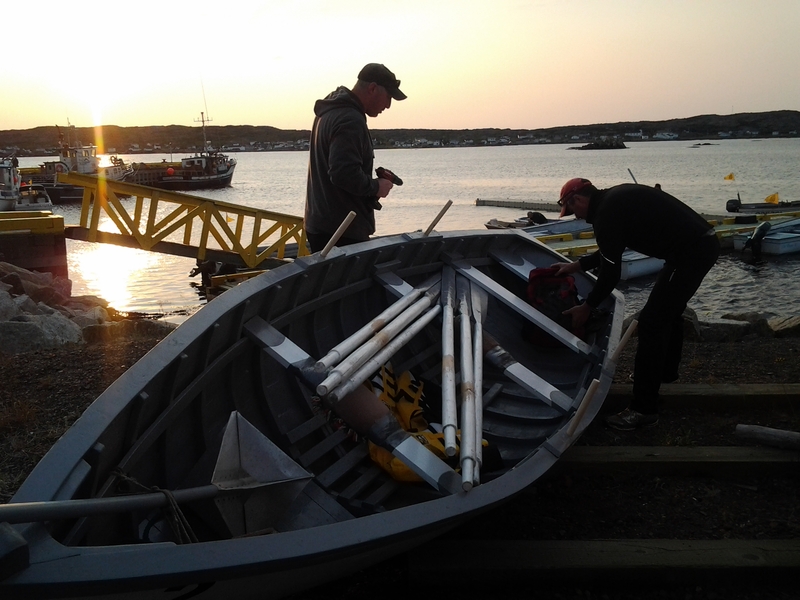 The only stipulation is that you MUST row a punt built to traditional specifications by a Change Island or Fogo Island boat builder. There is actually a small fleet that belongs to the Shorefast Foundation and competitors can have their name put in a a lottery to win the right to row one of those punts in the race. So, I woke up at 4:30 and couldn’t get back to sleep. 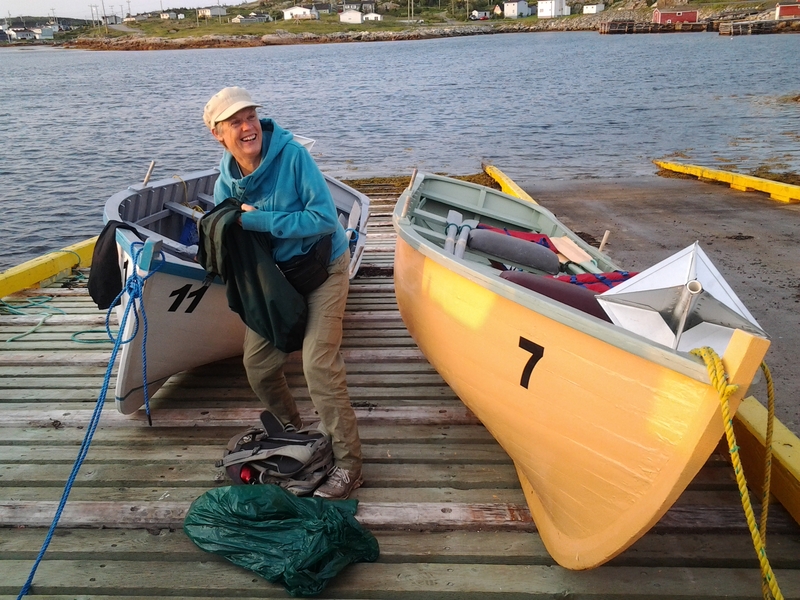 The Fogo Island Punt Race was supposed to start at 6:30 and I didn’t want to miss it. Showered and dressed just after 5:00 we were on the road in time to see the most beautiful sun predicting a very hot day. Traffic was lined off on both sides of the road in Joe Batts Arm. As we were getting out gear out of our parked car, I heard a cheery “Hello, Leo!” and Zita Cobb passed us on her way to the government wharf. I’m certain she could, and did, call every person by name as she made her way to the race committee. People were coming from all directions as they had a couple of time yesterday when the race was cancelled twice due to water conditions. This was looking like a fine morning. As part of the safety plan for the race, each punt has a safety marshal in a follow boat. Gradually all of the punts and rowers were in place and with a short delay so were the marshals. Peter Decker and Long Tom are as much a part of the race as the punts. Long Tom is a muzzle loader. A gun that dates back at least 200 years in his family, Pete jokes it’s a starting pistol now. 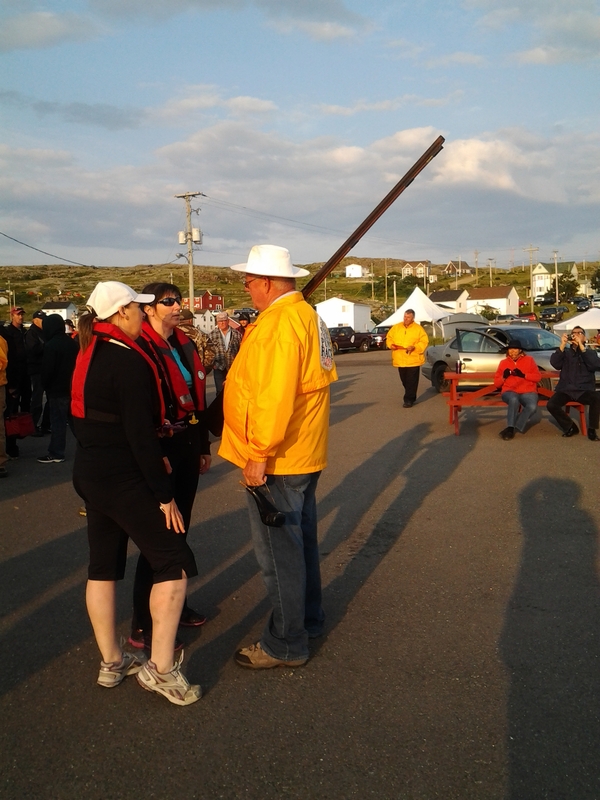 Complete with a powder horn and taller than most men on the wharf, Tom is pretty impressive. Pete Decker is no slouch either! Punts were lined up and a signal sent to Peter and Long Tom was fired. I’m sure the firing off the gun makes the rowers hearts race but it’s loud enough to cause a few nearby to miss a beat for sure. Due to the water conditions crossing Shoal Bay, the race was shortened to a turn on a buoy near Barr’d Island. Someone joked the buoy was moved because there were no cod in the original location and the punts were traditionally rowed long distances for fishing. 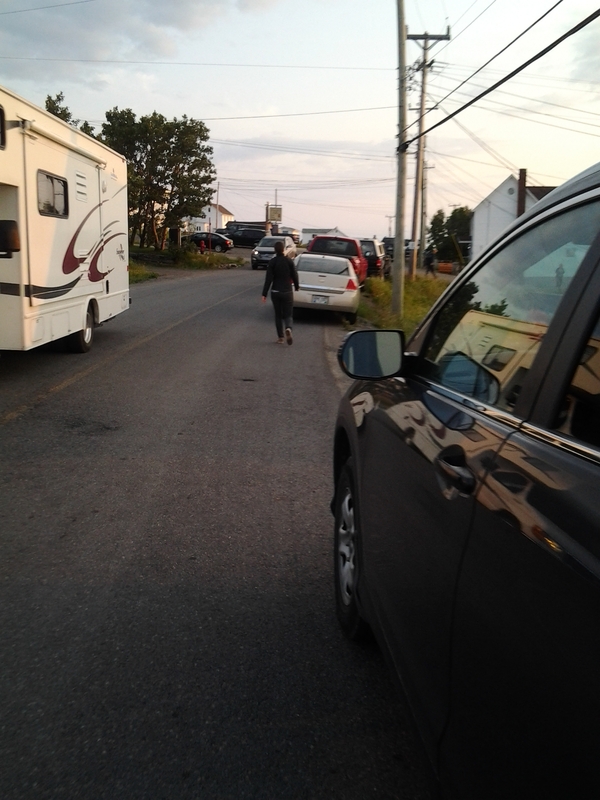 We watched the punts leave Joe Batts Arm and then went to the Fogo Island Inn to get a better vantage for the turn. It didn’t take long for there to be a front runner with last year’s winners pulling well ahead of the pack. They made the turn and went even faster on the return stretch. We rushed back to the wharf to catch the finish. 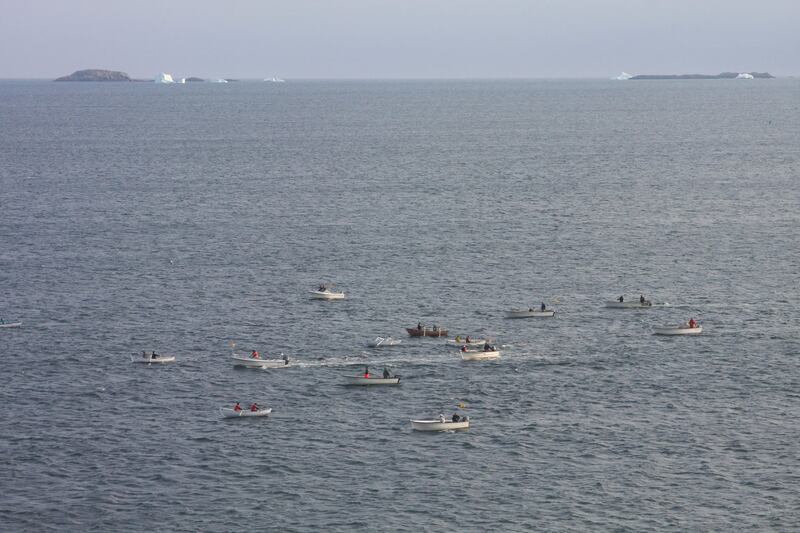 Punt Race as viewed and photographed by Tom Curran from his room at the Fogo Island Inn. Thanks for the pictures Tom. Floor to ceiling windows provide view of icebergs and punts. 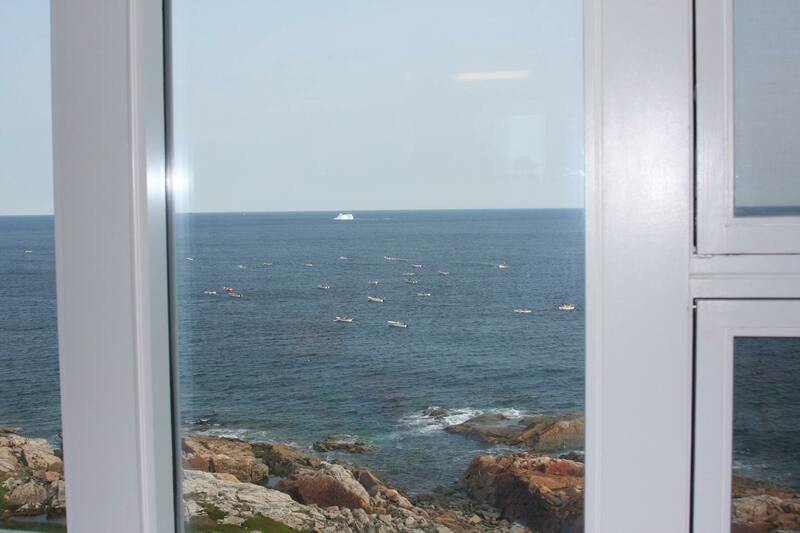 From Room 15, Fogo Island Inn. Photo credit, Tom Curran. We just made it on time to see the first punt cross the line with Kevin Purchase and Craig Freake pulling strong right across the finish line with the followers making the turn to the harbour. 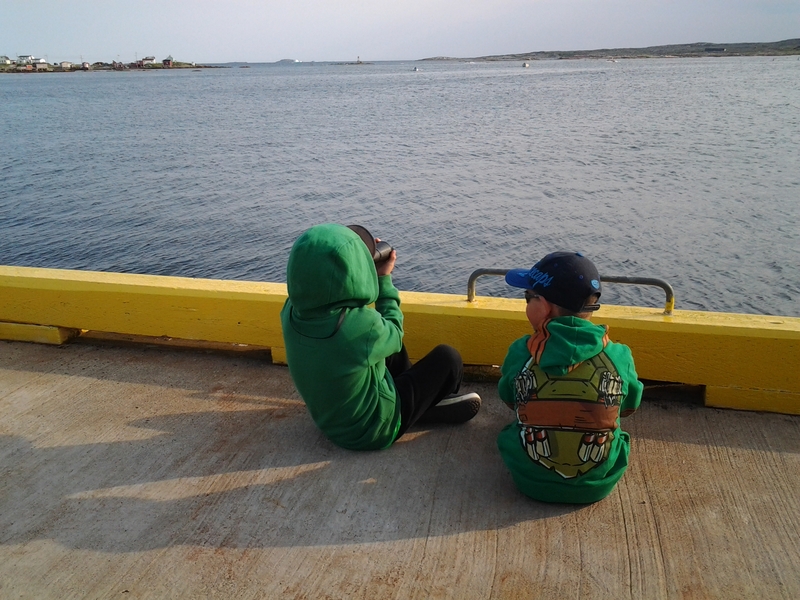 Two little boys were taking turns patiently with binoculars waiting for their mother. I was thinking they’d be waiting for a while based on the distance between the fastest boats and those trailing. 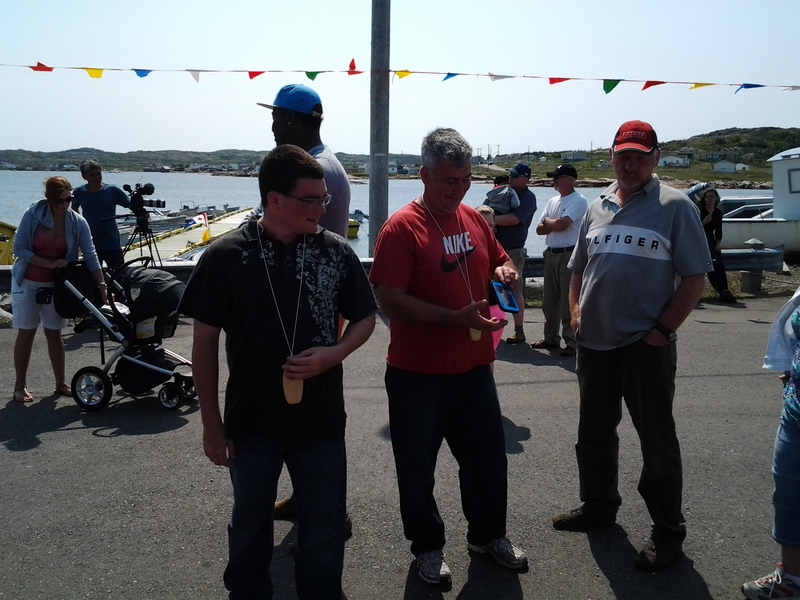 Watching for mom in the Fogo Island Punt Race 2014. 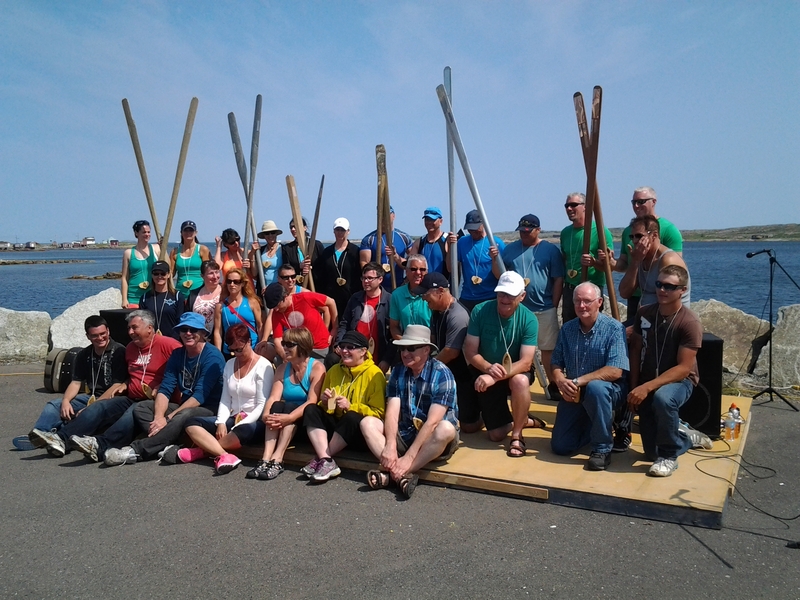 Brothers Wayne and Tom Freake from Fogo came in second and suddenly we recognized the pink, white and green oars of one of the women’s teams! 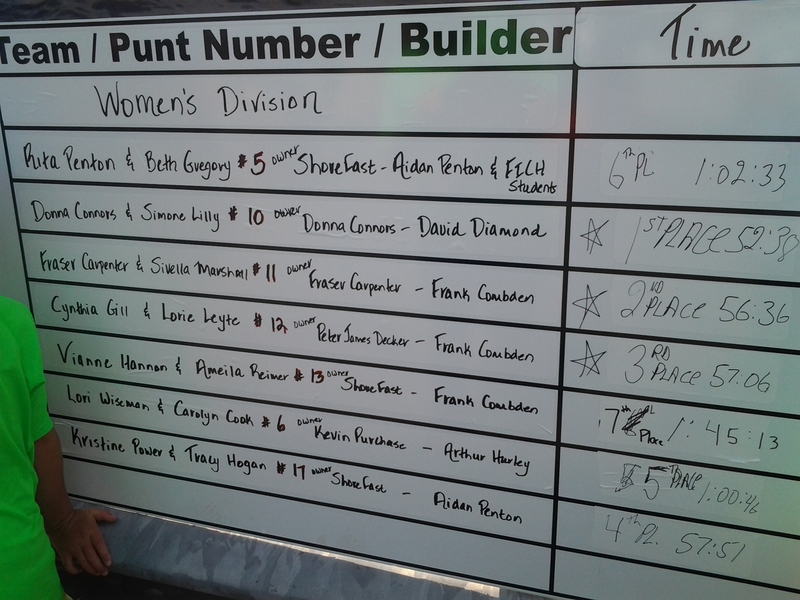 Simone Lilly and Donna Connors came fourth over all, behind the bronze men’s team of Joe and Neil Greene. The “Townie” girls told the boys they’d see them next year and put them on notice in their first ever appearance at the punt race! I’m thinking the men might see them from behind as they try to outrow the men. Not all punts were as fast as these so the final punt was seen with 4 follow boats along side. They offered assistance but were declined. They stayed nearby for support and encouragement as much as safety. Everyone finishing the race was greeted on the dock by Zita Cobb and members of the committee. With a couple of hours before the 11:00 ceremonies, we had time for a breakfast at Nicole’s Café near the government wharf. Not ususally open on Sundays, Nicole opened due to the punt race and had also fortified us with blueberry scones and coffee at 6 a.m. Breakfast was great, especially the side of homemade beans we split. Again, off to the wharf. Ceremonies were opened with Paddy and Mary Barry singing the Anthem and the Ode. 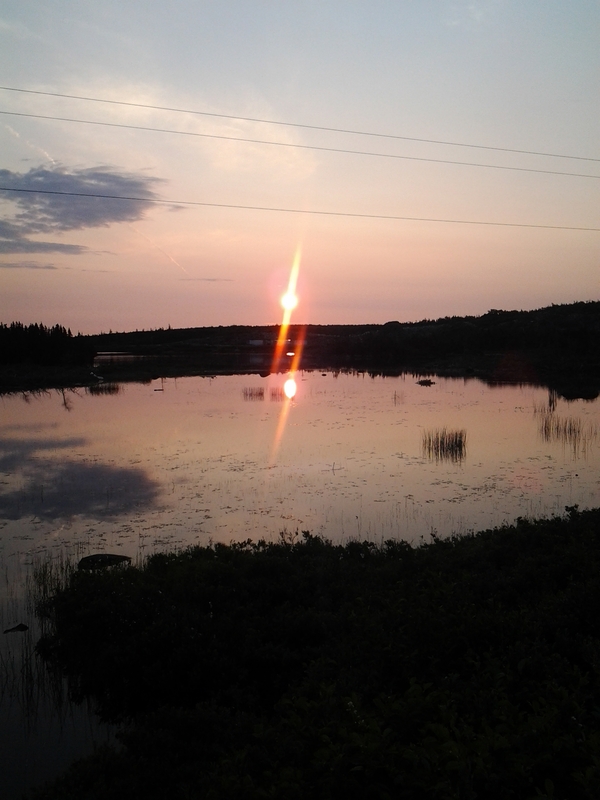 For those who don’t know the Ode to Newfoundland it needs to be heard by the water with a breeze and surrounded by Newfoundlanders. There is no song that I’m aware of, that brings more pride. They were, after all, Newfoundlanders before they were Canadians, only joining Canada in 1949. In addition to the honor, cash awards are made to first, second and third place finishers in each of the Men’s and Women’s divisions. All participants were acknowledged with attention paid to the fact that there were several teams of brothers, Freakes and Dwyers being two, a team of sisters, an uncle and nephew and the tourist favorite were the team of the grandfather and grandson, Gerald and Jordan Hart. 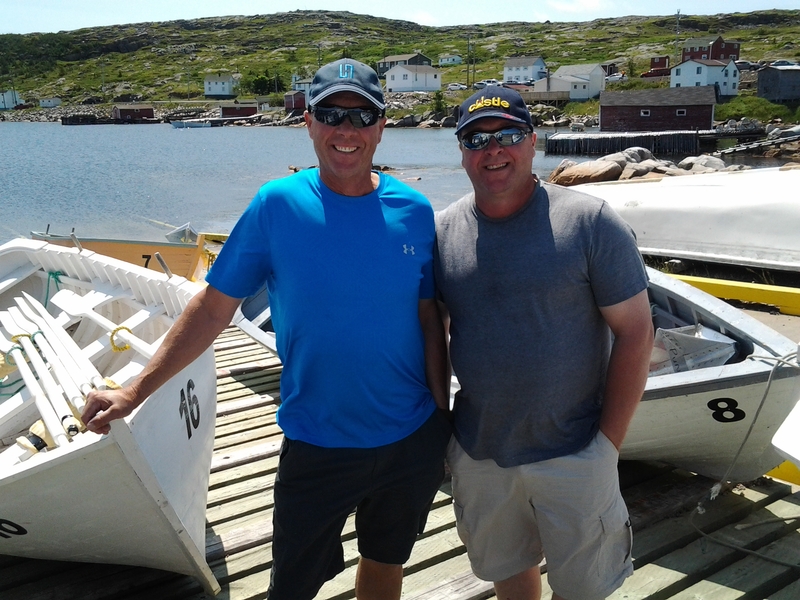 Change Island rowers, Reg and Caleb Edwards are father and son and got up at 4:30 to make it to Fogo in time for the race. After the placement prizes, the names of rowers who did not win a cash prize for placement were placed in a draw for four $250 cash awards. In addition to that, all names were placed for a chance to win a new punt and the crowd was excited that Caleb Edwards, who rowed with his dad, won his own punt. 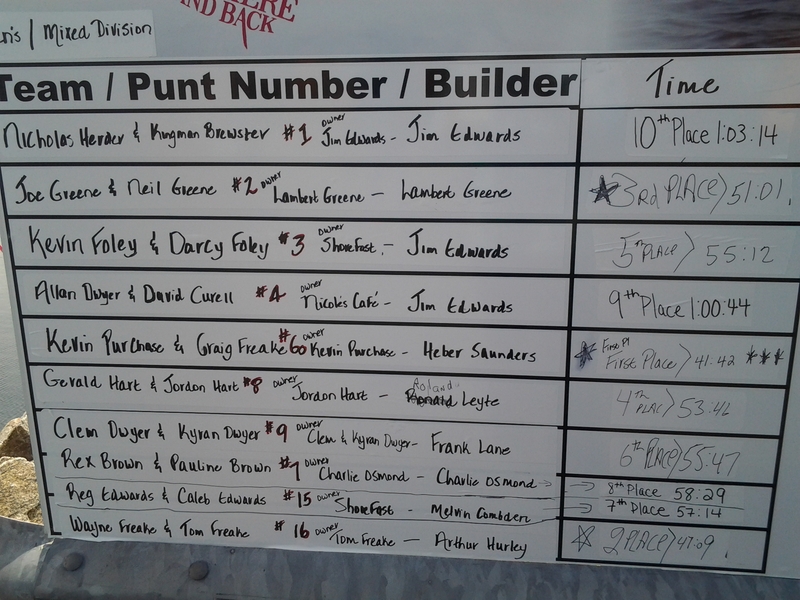 The Punt race was all the fun and community pride I had expected it to be. 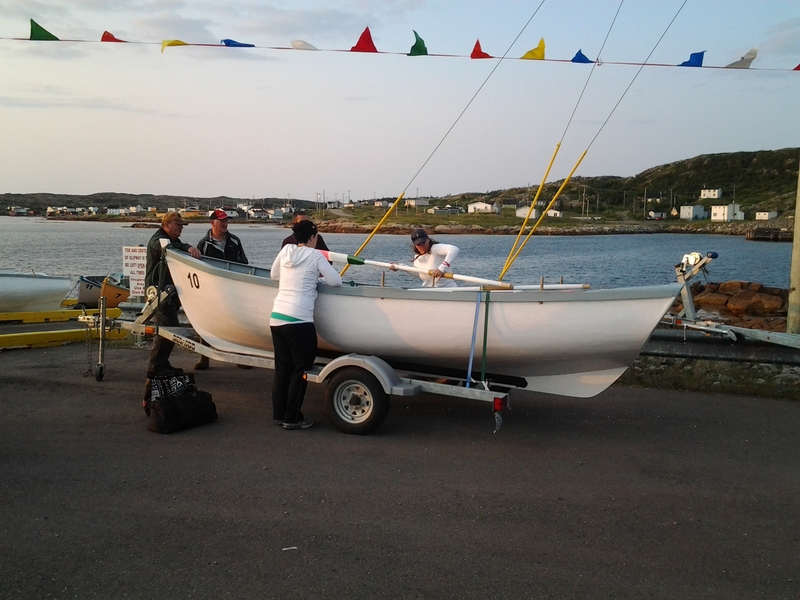 Carefully planned and in this case shortened for safety it was still a great event and I look forward to coming again and going to St. John’s on August 9 to see the Townie VS the Baymen punt race in St. John’s Harbour. A special thanks to Ross Osmond at Chesters Eatery on Fogo Island for allowing me to write at his dining room and use his wifi. He’s one of many business that benefited from the traffic of the Punt Race. It was a great spot to pick up dinner on the way home from the Punt race and thanks for not charging me rent as I sat here writing. 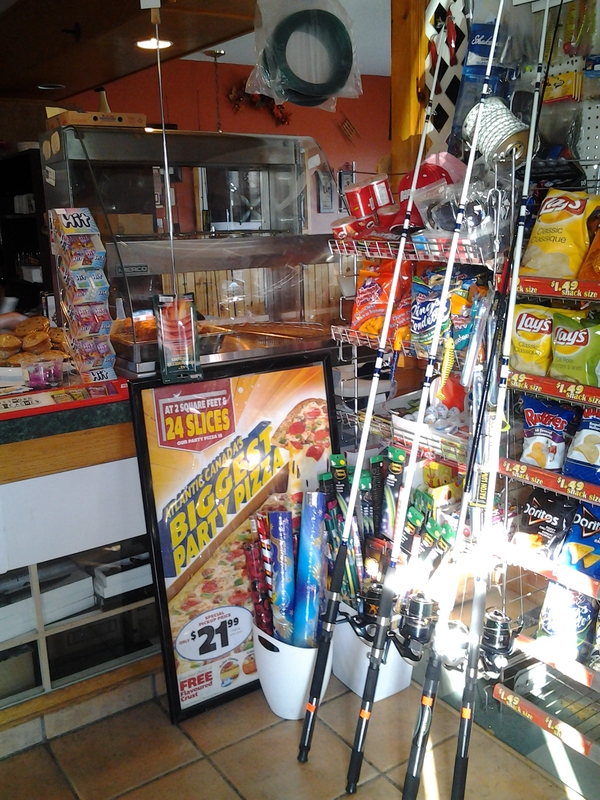 At Chesters, you can get everything from Fishing gear to Firecrackers! Chester’s Eatery. Fishing rods, fireworks and wifi among other great services and products. Thanks Ross. Interesting as usual Diane and was that bakeapples I saw ? Yes Sandra. That was the mother lode of bakeapples for sure. 4 gallons were picked the next morning.